Located in beautiful Ban Mae Nam, Villa Bougainvillea is a four-bedroom retreat overlooking 14-metre beach frontage and the water of the ocean sparkling in the distance. The architecture of the villa is such that it infuses the traditional with the modern in a seamless manner. The beguiling view can be enjoyed from each and every corner and living space of the villa to get the most out of your stay. There are four, spacious and well-furnished bedrooms at Villa Bougainvillea and each of these bedrooms has sliding glass doors that lead to the pool and garden. The master bedroom is furnished with a king-sized bed, as is two of the other bedrooms. The last bedroom is fitted with twin beds, so if you’re traveling with kids they can have their own fun space to enjoy in. All the bedrooms come with en-suite bathrooms that feature marble dreams and large, walk-in shower areas with modern faucets. A stunning 16-metre swimming pool stretches out towards the ocean to give an infinity-edge type of experience to the guests. At the end of the pool you will find a wooden garden swing, which is a cozy spot where you can read a good book while enjoying the scenic vista. 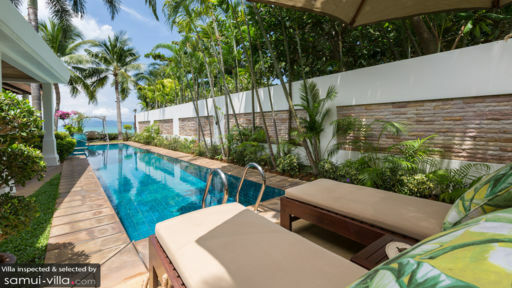 With daybeds places facing the ocean as well, there are numerous spaces in the tropical gardens, where amidst the natural elements, you can truly enjoy a tropical getaway while sunbathing, meditating or even breathing in the fresh air. A traditional sala houses a canopied daybed and alfresco dining for a magical experience, especially once the sun sets and the entire sky is awash with orange and yellow hues. Housed under a timber roof, the living area exudes an old-world charm and traditional aesthetic with polished wooden beams and furniture. Comfortable sofas and armchairs can be found to form the sitting area, which is perfect for an after-meal snooze or just spending some time with family and friends. A flat-screen TV is mounted on the wood-paneled wall and the spaces are furnished with traditional Thai artefacts and other mementos to add a cultural aspect to the décor as well. The dining area is furnished with an eight-seater dining table and overlooks the tropical gardens with its lush, green plants and trees. The elegant décor and classy interiors are luxurious and opulent, leaving you feeling pampered and completely rejuvenated. The kitchen features a Moroccan-tiled floor with wooden cabinets. 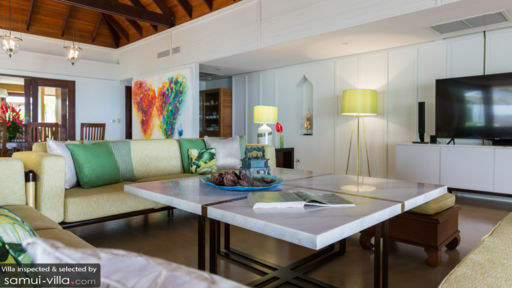 It is fitted with modern appliances and is fully-equipped to serve the guests of Villa Bougainvillea. The glass windows in the kitchen allow for cross-ventilation and natural sunlight to stream inside the room lighting up each nook and cranny of the kitchen. The island top is accompanied by barstools, where you can relax with a drink or simply enjoy a nice time while the food is being prepared! The villa staff includes a personal guest assistant, housekeeper, maids, gardener, and pool maintenance. They will be serving a large spread of delicious breakfast each morning to the guests as well to start your day off with a bang! 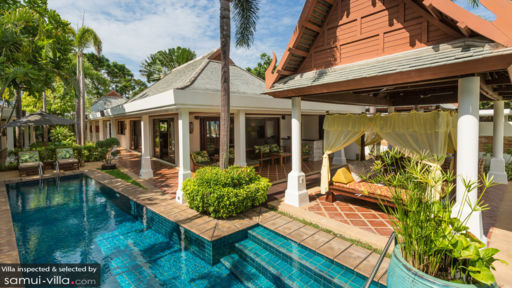 The villa is located in Ban Mae Nam thus, giving you access to the beach’s sandy shores and waves perfect for surfing, swimming, or sunbathing. Some of the gourmet restaurants that you can try out include Angela’s restaurant and The Boudoir. If it is a laidback and easygoing beach vibe you wish to attain, for a zen-like moment, then Bo Phut beach is the place for you!